Crusaders manager Stephen Baxter will have had better days as he watched his side lose their top spot in the league standings after a 3-0 defeat to Ballymena United on Saturday. It was a bitter pill to swallow for Baxter as his Crusaders had led the division for many months - only to be leap-frogged by Linfield with one game left to play this season. Two goals from Cathair Friel and one from Conor McCloskey sealed the win and three points for David Jeffrey’s Sky Blues - but there was no roaring and ranting from Baxter after the final whistle. “We had to play the game in the air instead of the ground because of the state of the pitch. “Ballymena have several very tall players so we knew it was going to be tough, we knew it was going to be a battle. “And that was how the first half panned out. First half was even but in the first 20 minutes of the second half we were very good and Gavin Whyte gets in and he should have scored. “Then we miss a ball down in the corner, Howard Beverland doesn’t make the tackle. Ball is in the box - goal - and you are chasing it. “We chased the game and we have put everthing we have into the game. There is no disappointment from me about my players as they gave everything they could today, competed for every ball and worked very hard. And Baxter - who had just heard about Linfield’s 5-1 demolition of Coleraine - says the pressure is now all on Linfield as they lead the league standings by a point. “Look we have been the hunted one for the last six months and now we are the hunters. “Now Linfield have to go and seal the deal and we have to look after our own fixture if we are even going to ask them a question. “And as I have said ‘if our best is not good enough then I will be the first one to congratulate Linfield and David Healy on a fine achievement’ but until it is all over we will fight to the death or when that final whistle blows,” said Baxter. United took the lead as Friel made a great run down the left. His pass found McCloskey and he made no mistake to make it 1-0. It was 2-0 to the home side as Crusaders keeper O’Neill was robbed by McMurray for Friel to shoot into the empty net. Then just as the Crues thought their day could not get any worse, McMurray found the unmarked Friel and he made no mistake. And there was no hiding United boss Jeffrey’s delight after the 3-0 victory. 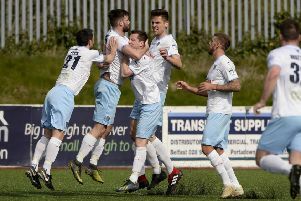 “It was a brilliant day for Ballymena United Football Club. “At the start of the season we talked about targeting the top six and we did that. But our first game after the split against Glenavon was very disappointing. We didn’t turn up the day. “We then performed lots better against Linfield and on the day Linfield deserved the win. “Then against Cliftonville during the week we challenged the players and we did well and won 4-1. “And today was just a carry on from the Reds match. I told the players before the game that Crusaders have consistantly been the best side for a number of year.